As you might expect, the Advanced tab on the Settings page contains some advanced options. The Advanced page in MailPoet 3 is significantly more simple than the corresponding page in MailPoet 2. After careful review, we decided to cut most of the available options, as they were almost never used. 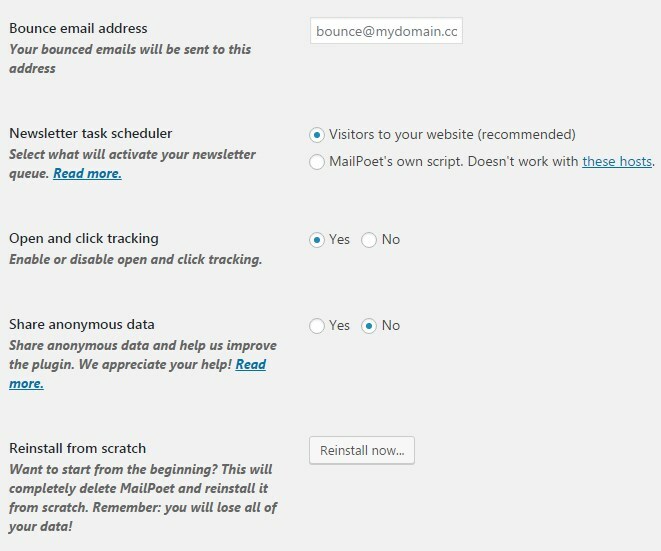 MailPoet will redirect bounce messages to this email address. Read more about bounce messages. For reasons explained in the link above, if you are sending with your own website/web server, we highly suggest you use an email address from the same domain as your website. This option allows you to choose the method by which MailPoet will manage your sending queue. Read more about this. Want MailPoet to collect statistics for you, such as how many newsletters were opened, links were clicked or the number of subscriptions canceled? If so, you should definitely use this option. Why shouldn't you use this option? You are experiencing redirection issues with your MailPoet links. Sometimes, disabling link tracking will fix this issue. By sharing your data anonymously with us, you can help the MailPoet team understand how people use MailPoet and what sort of features they like (and don't like.) Find out more. Wait a minute! Be very careful with this option. If you activate it, it will completely remove all your existing newsletters, subscribers, lists and settings from your MailPoet. You will not be able to recover them. If you need to use this option, be sure to first back up your database and export your newsletters and subscribers.